A north view in ink up the river Wear at Durham. The city was founded around 995AD by the monks of Lindisfarne, who had fled inland from Viking attacks. 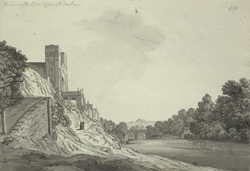 Situated on high ground and protected on three sides by the steep River Wear Gorge, Durham was an ideal site for their new monastery, and a fine resting place for the remains of their venerated forbear, St Cuthbert.